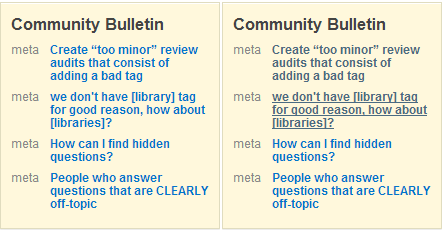 The Community Bulletin does not show proper link states of the questions. In the images below, I have visited all links. On a site refresh, all links become blue (left image). Only when I hover my mouse over the links, they become gray and stay that way (right picture, while hovering over the second link). On Windows 8.1, using Google Chrome Version 35.0.1916.114 m.
This behavior does not occur with the links on my profile page or the question page. Edit: Normally I'm running AdBlock with ads enabled for this site (AdBlock disabled). Disabling the AdBlock extension entirely does not resolve the bug. However, when I enable AdBlock (suppress the ads), the links seem to work normally, the way Shog9 described. Note that this same behavior happens on this meta site, where ads aren't even displayed.